If there is anything I like it is a good peel. Especially a good peel pad. I love AHA's and BHA's or even polyhydroxy acids (PHA's). I firmly believe that these are some of the best anti-aging and anti-acne weapons we have at our disposal for skincare. They work on both aging and acne and help to diminish the signs of hyperpigmentation, uneven skin tone, acne scars, acne lesions, fine lines and wrinkles, as well as firming up skin tone. How wonderful is that? These acids can do almost everything. Not everyone can handle them as well as others so there are some products out there that are more suitable for those with sensitive skin. The product I am reviewing here is a product more well suited for those who are used to using AHA's and can handle the strength these pads come in. 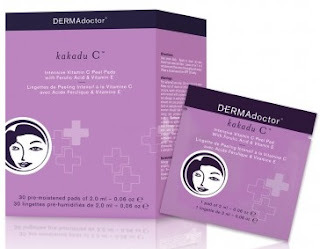 The DERMAdoctor kakadu C+ Intensive Vitamin C Peel Pads with Ferulic Acid & Vitamin E is a peel + treatment-in-1 that is great for those who would love to have brighter, smoother, firmer, more even skin. The pads treat hyperpigmentation, uneven skin tone, any sort of skin discolorations, exfoliate the skin, improve skin texture, smooth skin, firm skin and hydrate skin. Do you really think that these peel pads can accomplish all of these things? Well they could. It depends on the ingredients. These peel pads feature many sources of AHA's and a BHA (glycolic acid, lactic acid, mandelic acid, malic acid, citric acid, papain, potassium hydroxide as well as fruit extracts) plus Vitamin C, Ferulic Acid and Vitamin E. There are also anti-oxidant boosters, such as Australian Lime Caviar that help protect against free radical damage (free radicals help to destroy skin cells and age skin faster). These pads are balanced out with a calming complex so as not to irritate the skin, leaving it feeling hydrated and luminous. They have been Dermatologically tested, are hypoallergenic, allergy tested, non-comedogenic (this makes sense as they are an exfoliant), soap-free, oil-free, synthetic fragrance-free, synthetic dye-free, cruelty-free, paraben-free, gluten-free, phthalate-free, triclosan-free, hormone-free, GMO-free, sulfate-free, petrochemical-free, silicone-free and free of any animal testing. The pads contain hyaluronic acid to add moisture to the skin. Hyaluronic acid is a humectant molecule that holds 1,000 its own weight in water and will leave skin feeling very hydrated. It also delivers a powerful punch of Kakadu plum, one of the world's richest sources of natural Vitamin C grown on Earth. Shape awarded this product as its Beauty Award Winner for Best Peel. As you can see, this product definitely brightens, smooths and makes the complexion look radiant and luminous after use. It also provides firmer skin, softer skin, a more youthful looking skin, a more even looking tone, a more elastic (firmer) skin, a great exfoliation and hydration skin. Many women thought the pads provided an improvement in pore size too (always a plus) and agreed the formula was very gentle on the skin. Personally, I had great results with these pads. I have been working for months at brightening up my skin. I have a lot of photodamage from sunburns that occurred when I was younger (even in my twenties in Greece). So I am paying for it now with freckles all over my face that look like bad sun damage. I have been using various forms of Vitamin C and peels. What is great is this product has both in them so you get to brighten, exfoliate and do both at once. Peels naturally brighten up the skin tone, getting rid of hyperpigmentation or photo damage and Vitamin C also helps to get rid of both of those conditions too. Now this product is like a superhero of fighting off the signs of aging in one super product. I'm very happy with these pads and highly recommend them to anyone who has the following: photodamage, fine lines, uneven skin tone, hyperpigmentation, acne scars and the need to firm and smooth skin. I would recommend these pads for the following skin types: mature, dry, normal, combination, oily and acneic skins (except those with very active pustules). If you have pustules, wait until they are gone or healed some. These pads would help with your acne and definitely help with acne scarring. 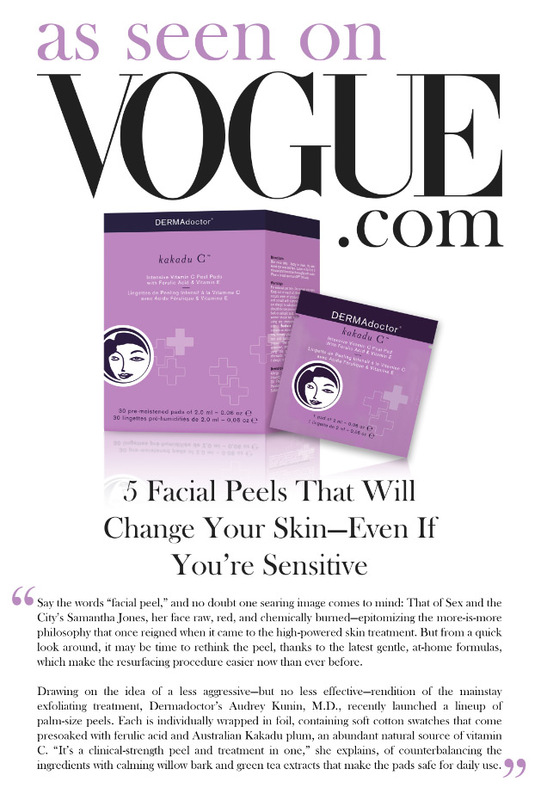 DERMAdoctor kakadu C+ Intensive Vitamin C Peel Pads with Ferulic Acid & Vitamin E retail for $78.00 and can be found online at www.dermadoctor.com, www.dermstore.com,www.sephora.com, www.ulta.com, www.skinstore.com, www.nordstrom.com and in brick and mortar stores like SEPHORA and Ulta Beauty. Like Dermadoctor on Facebook: http://www.facebook.com/pages/DERMAdoctor/81935132210; Follow Dermadoctor on Twitter: @dermadoctor; Follow Dermadoctor on Pinterest: http://pinterest.com/dermadoctor/; Follow Dermadoctor on Instagram: https://www.instagram.com/dermadoctor_skincare/ and Subscribe to Dermadoctor on YouTube: http://www.youtube.com/dermadoctor.